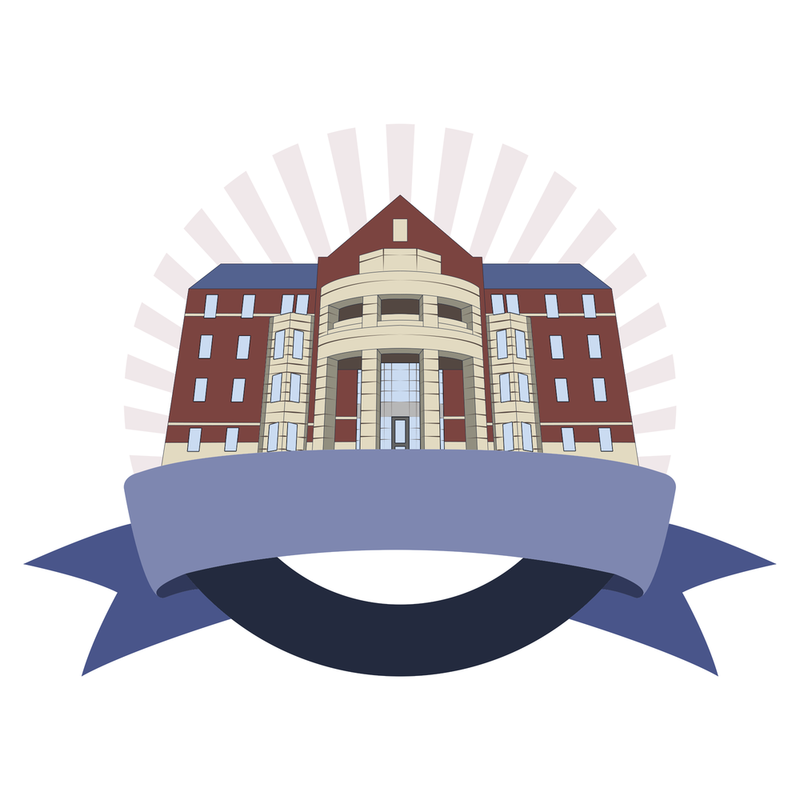 In early October 2015, I had the opportunity to enter a logo design contest organized by the Georgia Tech Department of Housing. 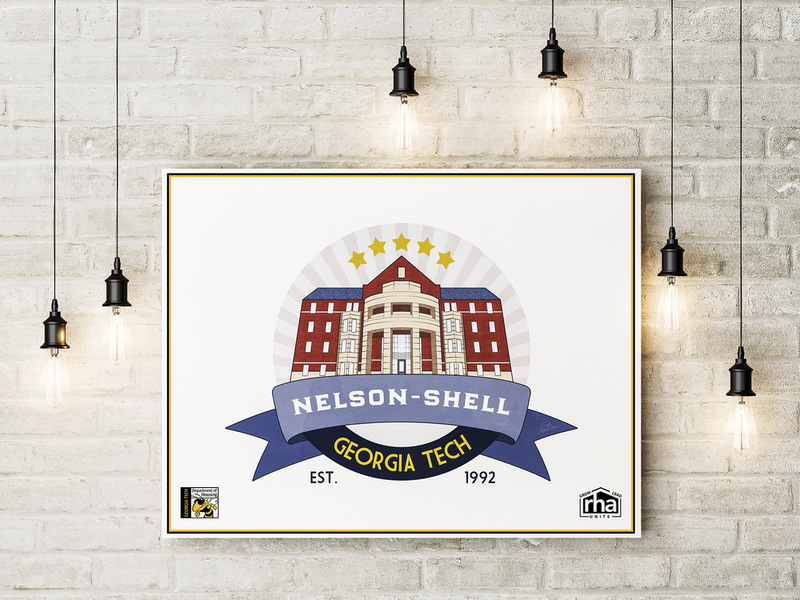 Formerly called the Undergraduate Living Center, a building on west campus was being renamed as "Nelson-Shell" and asked its student residents to design a logo to represent the newly-named hall. The logo had to incorporate the hall's name, and it were to be used on its social media pages, signage and flyers throughout the building, and other various promotional items. The winning logo would be selected via a resident voting poll. Prior to drafting the logo, I wanted a design that was different, but could appeal to a wide range of people. For this reason, I was drawn to retro-style badges. The defining attributes of retro-style design would provide the character that could make the logo stand out from the rest; meanwhile, I saw the opportunity to offer trendier, modern twist that would appeal to its residents and staff members. Plus, the "badge" style - acting as an emblem that can be simply applied anywhere but without disrupting the content - seemed appropriate for the purpose of the logo's usage. The logo needed a defining symbol. And what other things to better represent the building than the building itself? I chose Nelson-Shell's iconic front entrance as the main image of the badge, embellished with a flattened ribbon designated for the name of the hall. To further achieve the retro-style badge look, its form was simplified, and the colors were muted and were kept at a minimum. Beside the hall name, "Georgia Tech" was included to provide a sense of Nelson-Shell's inclusion in the Georgia Tech community. On October 23rd, I was notified that my design had won the contest by receiving the most amount of votes. Therefore, it was chosen as the official logo of Nelson-Shell. However, the design entered for the contest didn't seem enough to be a good representation - after all, it was to be used everywhere, so I decided to polish things up a bit. * Click to enlarge progress photos. For more realism, stripe details were added, and the textures on the red brick walls and the roof were altered. The ribbon was curved and wrapped around the badge to break the intense amount of linearities in the imagery and also to match the arched portico. The off-centering of the radial burst in the initial design was also fixed. Tone was slightly increased for more lively and brighter impression. Check out how my logo's being used here.